The Rockland, Thomaston & Camden Street Railway served the Mid-coast Maine towns of Camden, Rockport, Glen Cove, Rockland, Thomaston and Warren. Service was provided along 21 miles of track from Camden, through Rockport and Rockland to Thomaston and Warren. Service was inaugurated in August of 18921 and continued for 29 years. At it's height half-hourly service was provided . A freight and baggage car made two trips daily from Rockport to Camden. An additional baggage, mail and express car made three round trips 4. A trip the full length of the line from Camden to Warren would take a hour and 25 minutes. Camden to Rockport took 7 minutes, Rockport to Rockland took 30 minutes. From Rockland it was a 23 minute ride to Thomaston and a further 25 minutes from Thomaston to Warren. The original fare in 1892 was 5¢ for the first 26 years of service. Between 1918 and 1924, it was increased to 6¢, 7¢ and finally 10¢ where it stayed until 1931. The line was divided into seven overlapping zones, a single fare permitting a ride through one zone and part of the next 4. The Warren line was discontinued in October of 1925. The last run between Camden and Thomaston was on May 31, 1931. The next day service was replaced by a Northeastern Transportation Co. bus. 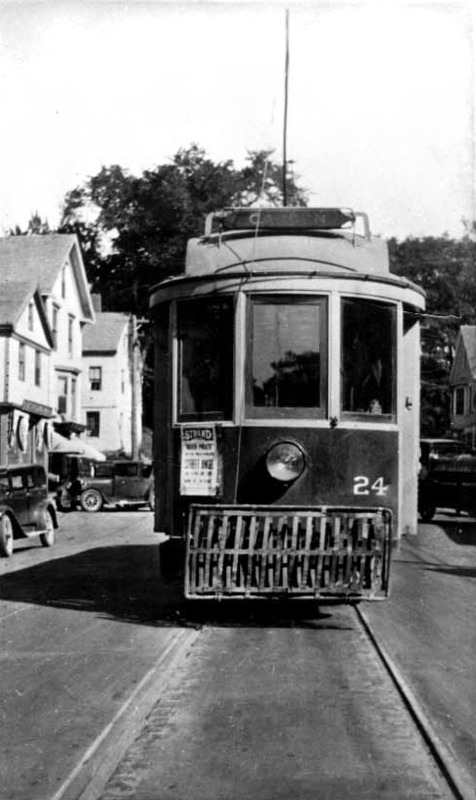 At the time of abandonment 11 trolley cars were in service 4. Express and Mail Car on Main St. In Camden, Maine. Car Number 4 at Oakland Park, Rockport, Maine. Edwin J. Kalloch first motorman for the Rockland, Thomaston and Camden Street Railway. 1924 Flyer advertising a railroad excursion to Old Orchard Beach with connecting special Electric Car service from Camden. Cummings, O. R. Transportation Volume VI, Part 1. "Rockland, Thomaston and Camden Street Railway." Conn. Valley Chapter, National Historical Society, Inc., Stratford, CT, 1952. All photographs that appear on this page are believed to be in the public domain and are intended for educational use only.